Summer is in full swing and with it has come cook-outs, picnics, and family gatherings where having the ingredients on hand for an easy and favorite dish to pass is a must. This weekend we are heading to my parents house for our family’s annual 4th of July Celebration and while we do a lot of things while we are all together, the thing we probably do best is share good food. 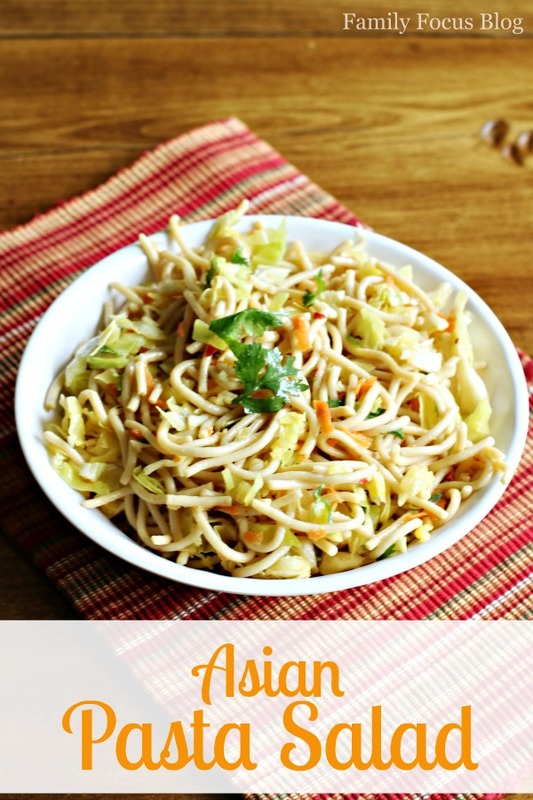 This year I’ll be taking my Gluten Free Asian Pasta Salad. It’s my new favorite summer dish because the flavors are not only amazing but it’s so easy to toss together as well. It’s also so good that no one will suspect it’s gluten free! Begin by cooking your pasta according to the package instructions, taking care not to overcook. While pasta is cooking peel and rinse carrots. Grate them and set aside. Rinse cilantro and chop into small pieces. Use as little or as much as you like. If you are using fresh cabbage, rinse and chop into small pieces. If using a bagged, pre-chopped cabbage transfer to a large bowl. 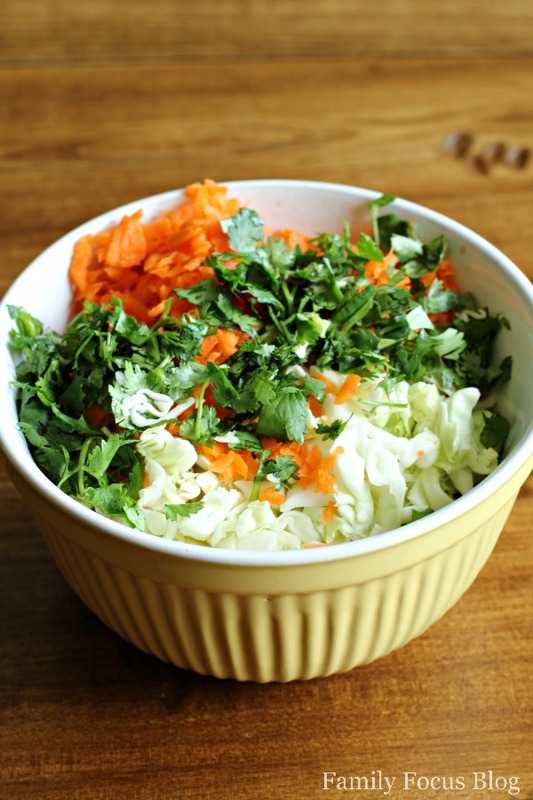 Mix cilantro, carrots, and cabbage together. When pasta is done cooking, drain and immediately rinse with cold water for several minutes to stop the cooking process. Toss with a drizzle of olive oil to prevent noodles from sticking together. Allow it to finish cooling while you make your dressing. 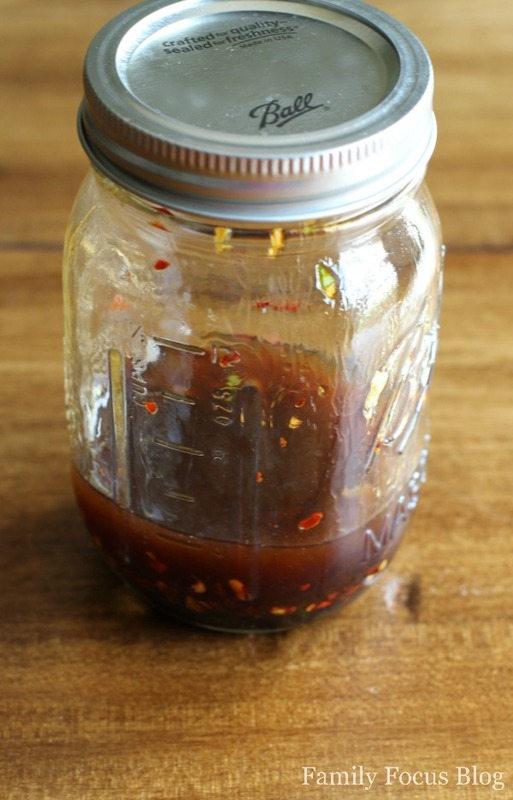 To make dressing combine the olive oil, sesame oil, soy sauce, and red pepper flakes in a mason jar. Chop the garlic cloves and add them to the jar. Shake vigorously to combine. Combine cooled pasta with the cabbage mixture and stir in the dressing. Add salt and pepper to taste. Keep the salad refrigerated until ready to serve! Of course, this salad could be made with regular pasta for a non gluten free option. You may also enjoy this gluten free popcorn chicken recipe. Well now I know what’s for dinner!! Nom Nom!! Let me know what you think! I seriously can’t get enough. It’s like combining coleslaw and pasta salad which are 2 favorites anyway! Looks delicious and healthy! Have a great 4th of July! This sounds like a delicious recipe. You have great taste. I would love for you to check out my Etsy shop! This looks delicious. I have been living gluten-free for almost a year now. 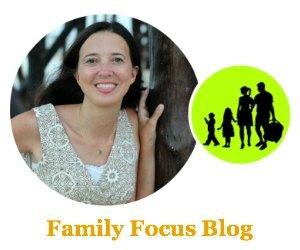 I also try to avoid giving our two kids food made of grains with gluten. It is very challenging here in Germany.